Have you been through Sioux City recently? Similar to the never-ending I-29 modification project, Sioux City and Siouxland are under total construction. Not only are contractors such as Lloyd Companies, Klinger Construction and H & R Construction building apartments and working on the new interstate, there are many different businesses reshaping the entire Missouri River corridor. 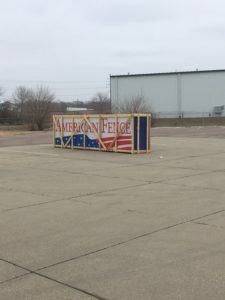 Did you hear about the new American Fence Company now open at 4700 S. York Street in Sioux City IA? It’s happening! One of American Fence Company’s most recent Sioux City projects was at Riverbend Townhomes. As the top choice for Sioux City’s ornamental fence installation, they chose American Fence Company to install their ornamental pool fence. Riverbend Townhomes chose a sleek, white ornamental iron that will not be too hot in the blazing summer sun. Pool fencing can be tricky as you must meet the National Building Officials and Code Administrators Standards and Regulations. This includes such requirements as child-proof gate latches and pickets that are no further than 1.75 inches apart. American Fence Company is experienced in installing pool fence and knows all the requirements and regulations for pool fences and gates. Read more for yourself about pool fence safety. 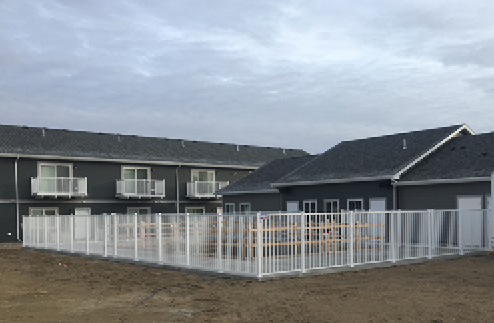 A long with the ornamental pool fencing, American Fence Company of Sioux City installed vinyl dividers at Riverbend Townhomes. We are a multitalented company that installs vinyl fence, wood fence, ornamental fence, chain link fence and more in Sioux City and the surrounding areas. To get a free quote for your upcoming spring project, please submit an online request or call us at 712-454-7732 today. ← American Fence Company has come to Sioux City!